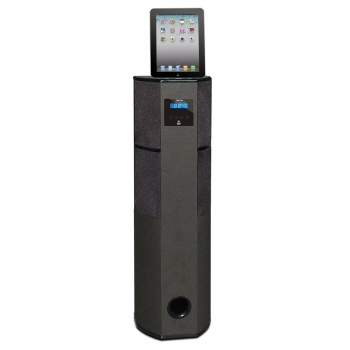 The Bluetooth Home Theater Tower brings a beautiful, powerful sound system, 30-pin iPod, iPhone, iPad player and charger to any room of your home. The 600 watt system booms with power, thanks to built-in dual tweeters, dual 3.5" mid-range drivers, and an 8" subwoofer that packs a massive punch. 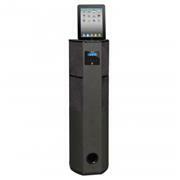 Bluetooth compatibility allows you to stream your favorite music or internet radio stations easily and wire-free. Plug in your iPad, iPhone, or iPod, to the docking station location at the top of the unit, and you're ready to go - plus, this unit charges your iDevice, so the party will never end. More features include 2.1 channel digital amplifier, built-in FM radio, alarm clock and time control so you can wake up to your favorite music, and AUX input so you can connect and stream audio from other digital music players and external media sources. Use the front panel touch controls or the included remote to adjust the volume, bass, treble, and even remotely control your iDevice when docked. The blue LCD display is bright and crisp, and the matte black finish will add an elegant and clean design to your full ranged audio. Includes 110V AC power adapter.